It’s been a rewarding five years serving as the founding Executive Director of the Berkeley Food Institute. I have thoroughly appreciated and enjoyed working with an amazing, dedicated group of colleagues, faculty, students, funders, and community partners to develop and grow programs to create more sustainable, healthful, and just food systems. I am heartened by BFI’s progress in catalyzing research, empowering students, impacting policy, and more. I’m inspired by the new generation of leaders involved in food systems at Berkeley and far beyond. With mixed emotions, I share news of my retirement as Executive Director of BFI effective at the end of this year. I look forward to moving on to new adventures but will remain in an advisory capacity with BFI. I am excited to announce that Nina F. Ichikawa, currently BFI’s Policy Director, will serve as Interim Executive Director. Dr. Kristine Madsen will continue as BFI Faculty Director, and our other highly capable BFI staff will continue to serve during this time of transition. I feel honored to have been involved in BFI since its beginning and am excited to see the Institute’s continued success. I am very grateful to our funders and wonderful team who have enabled BFI to thrive. Thank you for your support of BFI, past, present, and future. PS: Individual gifts provide a critical base of support for BFI’s programs. As this season of giving and gratitude approaches, please consider a gift to fuel our work to create diverse, just, resilient, and healthy food systems. Thank you! A class field trip to the UC Gill Tract Community Farm. As an urban land-grant university, UC Berkeley is in a unique position to conduct research, teaching, and outreach on metropolitan food production. 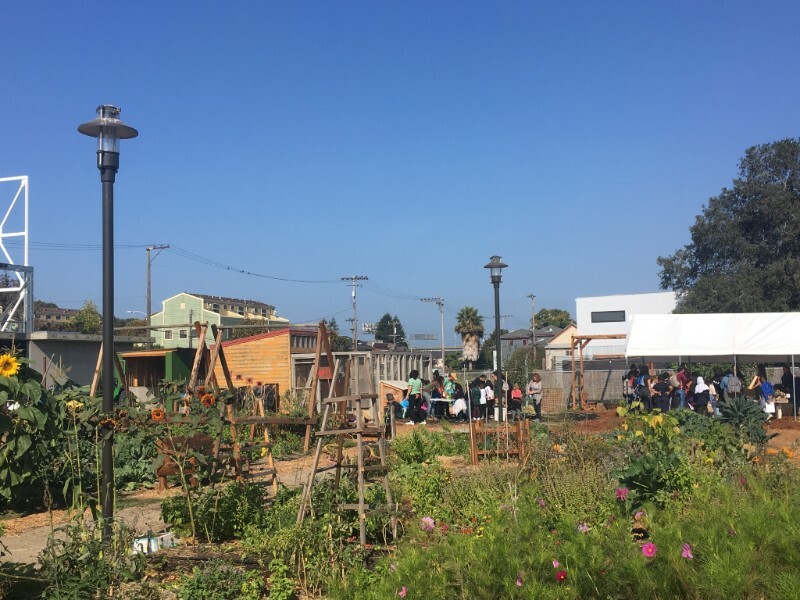 In this newsletter, we share cutting edge Berkeley Food Institute research and resources on the challenges and opportunities of growing and distributing food in the city. Urban agriculture is often an important component of community food security and food sovereignty, for the simple reason that “growing your own food is a transformative act” (Helmer 2016). This past spring the Berkeley Food Institute launched a 3-year collaborative research, education, and extension urban agriculture project, Sustainable Urban Farming for Resilience and Food Security, to better understand and address questions of urban agriculture viability, sustainability, and equity within the East Bay community and beyond. In a new blog post lead researchers Jennifer Sowerwine and Charisma Acey discuss the project team’s work on assessing food access and food distribution methods, soil health and soil contamination, and beneficial insects and their habitats. Read more here. 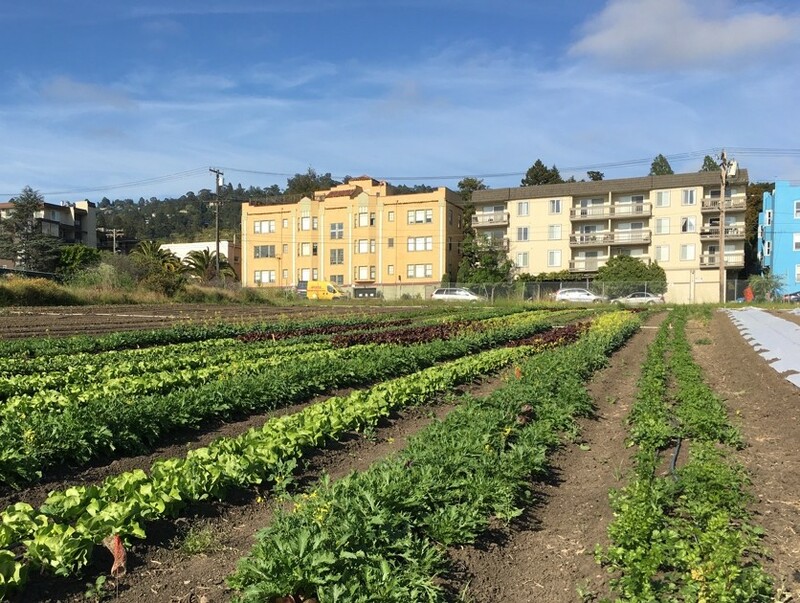 The City of Berkeley has instituted a set of zoning and rule changes aimed to make agriculture in the city easier and more affordable for would-be urban farmers. Small-scale produce growers (livestock and cannabis are excluded) are now able to grow and donate or sell without a permit; larger-scale operations will see their fees lowered and paperwork reduced. BFI friend Rob Bennaton of UC Cooperative Extension is quoted in an article on the changes in Berkeleyside. A research plot at the Oxford Tract. Photo by Timothy Bowles. A new literature review in the Journal of Sustainability conducted by Alana Siegner, Jennifer Sowerwine, and Charisma Acey, found that while many studies cite the potential food security benefits of urban agriculture, there are few that robustly measure the impact of urban farms on improving food security in low-income communities. Without understanding deeper historical and structural challenges including poverty, racism, and divestment in specific communities and neighborhoods, policymakers and advocates risk backing policies that could have unintended consequences or negative impacts on vulnerable communities. In a recent article in the Journal of Sustainability Joshua Arnold and Paul Rogé report on how land security affects urban farms' ability to persist. The researchers divided urban agriculture sites by tenure status (high-security and low-security) and found that affiliation with a school, sufficient funds for irrigation services, and ability to hire staff are important indicators of their land tenure status and can seriously impact the amount of food they can produce. The authors emphasize the importance of equity in financial and institutional support for urban farms. 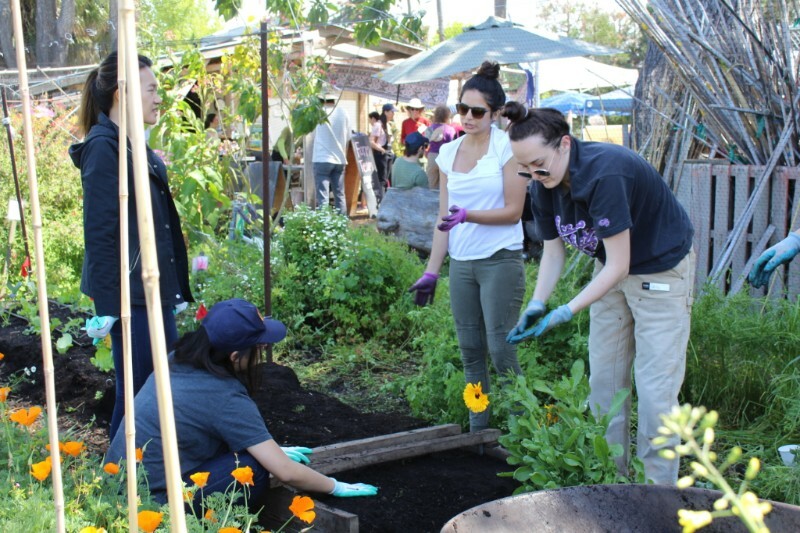 Students working at the UC Gill Tract Community Farm. Photo by Mollyvan Lamouth. This presentation by Center for Diversified Farming Systems postdoctoral scholar Antoinette M. Dumont will focus on the socioeconomic dimensions of agroecology by first identifying a list of principles in popular and scientific literature and, as a second step, by putting the principles to the test of a qualitative study of a diversity of Belgian food systems. Event details here. 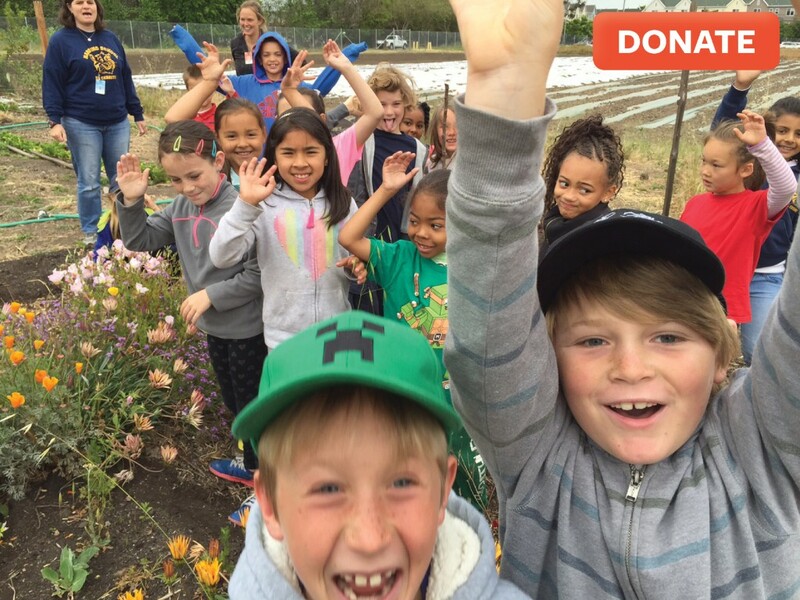 Get your hands dirty, and hang out with the community while cultivating and nourishing the fruits and vegetables that help feed the Bay Area. Create new relationships with local community members, spread happiness to the neighborhood and the earth, and promote positive change for the environment. Invite your friends; everyone is welcome! Event details here.